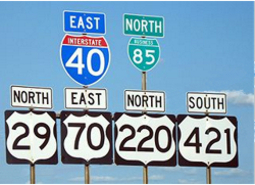 Route Signs & Markers by Street Sign USA! Choose from a selection of route signs, directional arrows and auxiliary signs. Create your own custom route marker for actual road use or for personal, decorative & novelty purpsoses. Municipal grade & MUTCD compliant. Laminated with 3M Engineer Grade Prismatic (EGP) reflective sheeting or upgrade to 3M High Intensity Prismatic (HIA) sheeting. Optimum reflective performance of 7-10 years & more!